This week’s giveaway will highlight the Reflections category. It’s where I just share things from my life and family. So I thought I’d make the giveaway a bit more personal too, and send the winner a little care package of my favorite things. I’m praying that this goes to someone who really can use a little pick me up. I love the ebony Recollections pen with the super fine tip. I get them at art supply stores a couple of times a year and guard them with my super Ninja moves because people around here steal pens. This giveaway is open only to U.S. residents over the age of 18. This giveaway will open at midnight on Sunday, March 1st, and close at midnight on Sunday, March 7th. I will randomly select one winner, using rafflecopter. The winner will be contacted by the email that they provide in the comments, and will have 48 hours from the close of the giveaway to respond and claim the prize, or the prize will be forfeited and another winner will be randomly selected. I’ll ship the box to a continental US address provided by the winner. What a sweet collection of lovely gift. Would be a wonderful pick me up . Would love it. Feeling overwhelmed. Thank you for the chance. I would love to win this. It has been abnormally cold here in the south and it has made life a little dreary and sad. It would be nice to have a pick-me-up! 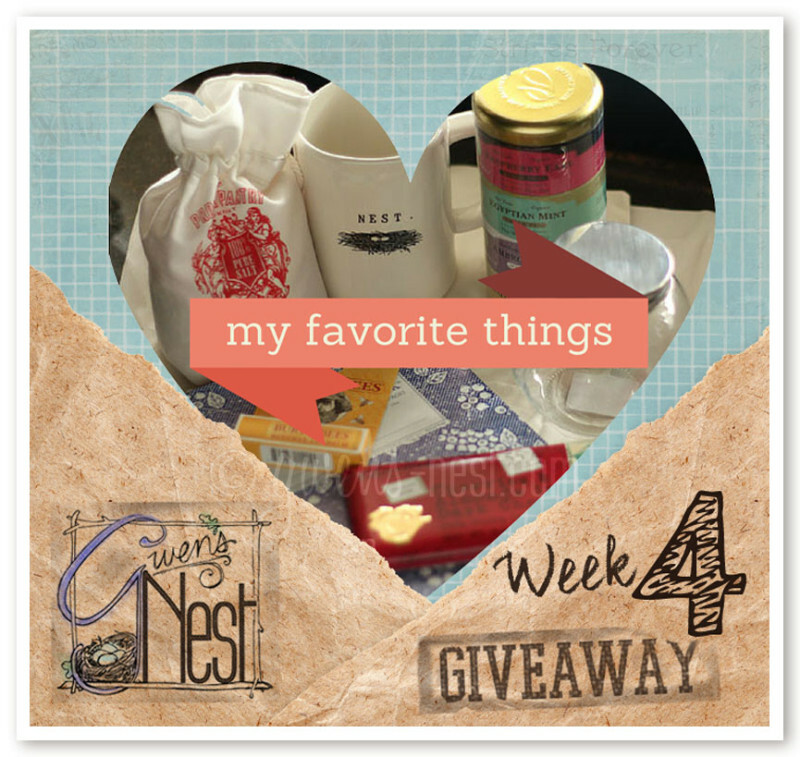 Love all the things going into this wonderful giveaway. 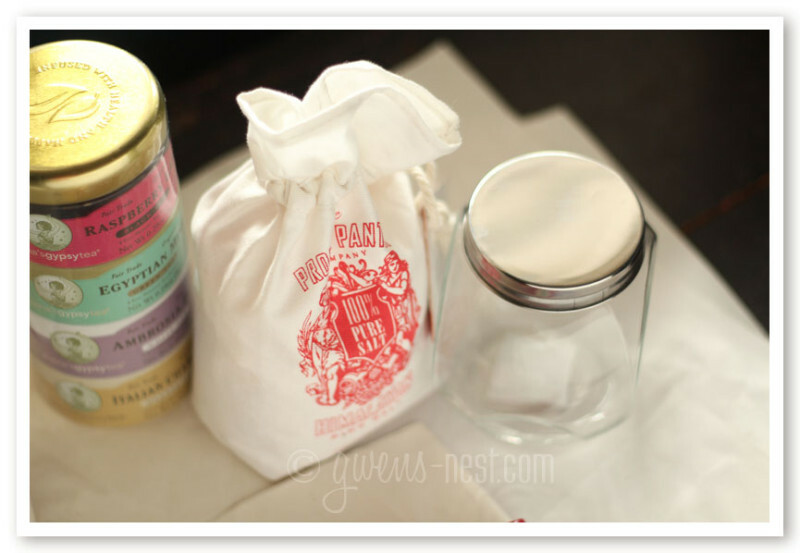 My favorite item would be the darling cup..,but I also love the idea of getting one of your sauce mixes in the spice jar! Thanks for the opportunity! Love your blog and your recipes! Awesome giveaway!! Would love a jar of one of your spice mixes….oh but which one? I would love to win your “favorite things”! I love that you are including a choice of spice mix in the box, I just can’t decide if I’d choose the Taco or Greek mix, they both look so good! I subscribed to weekly emails! I love all of it, but the pink Himalayan salt in a bag is my favorite. I’m intrigued by the salt. And I love the mug! 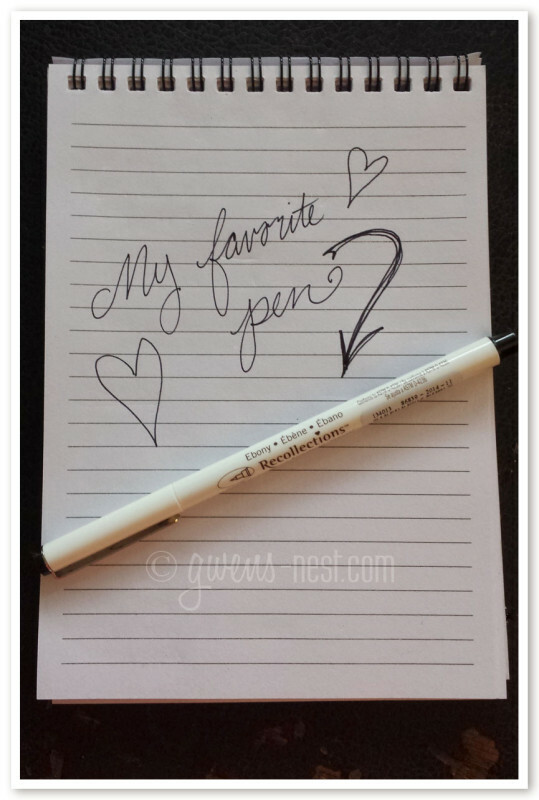 And even if I don’t win–I would love to know what your favorite pen is! LOVE Burt’s Bees! Thanks for sharing your favorite things. It’s hard to choose one favorite thing. I like the chocolate and the tea! Awesome giveaway! Would love to try the tea. The cherries & almonds chocolate bar would be in my top favorites, for sure, but I love pink Himalayan salt, and tea, too…so it’s hard to pick just 1 favorite. Love your blog, Gwen! Thanks for sharing your journey with us! The chocolate bar! Really a fun idea for a giveaway! The dark chocolate bar with almonds and cherries look delicious! I would love to try it! Well, I confess that my interest is piqued on that chocolate! And I’ve been wanting to try Himalayan pink salt to see if I can truly tell a difference. And I always love Burt’s Bees and notebooks, and I’m really curious about your pen, since I just discovered a new favorite myself, and I am wondering about Greek seasoning now. Lots of goodies in this that I would enjoy! It would make my day to win it, I confess. 🙂 Fun winter blues chaser! I just bought that tea sampler this weekend! Entering to win….love ya! What an awesome gift! My favorite would be the choice of your seasonings. I think I’ll choose Ranch, although Greek would be great also! I love the tower of teas! Chocolate. Or maybe the tea! I love the tea! Our family is drinking lots of tea on these gray days. What a sweet gift…would not expect anything less from such a sweet person! Blessings for your day, Gwen! What a great giveaway idea! Love it! 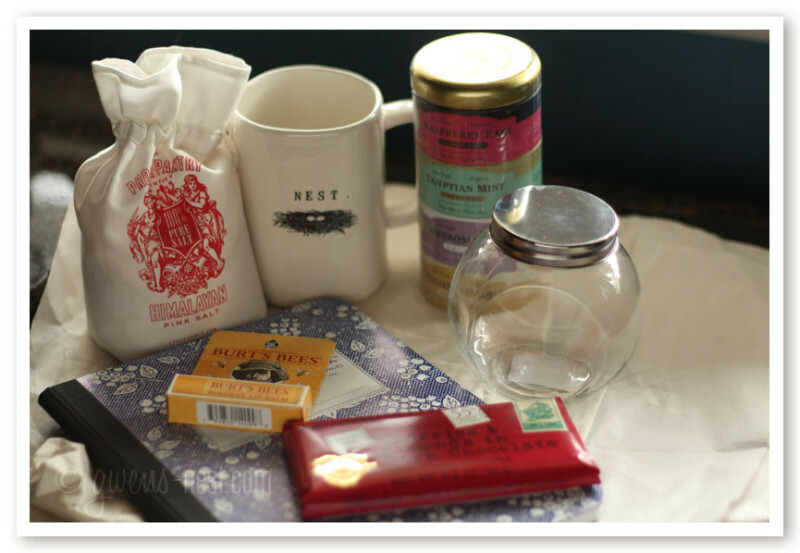 I love the towering teas and the mug!! So cute, and I need a pick me up—have been snowed in so long—need a boost. Oh, I love LOVE the blueberry notebook! Besides cranberry country, we have loads of blueberry patches. MMMM! Great gifts. I can never have enough chapstick! Hi! 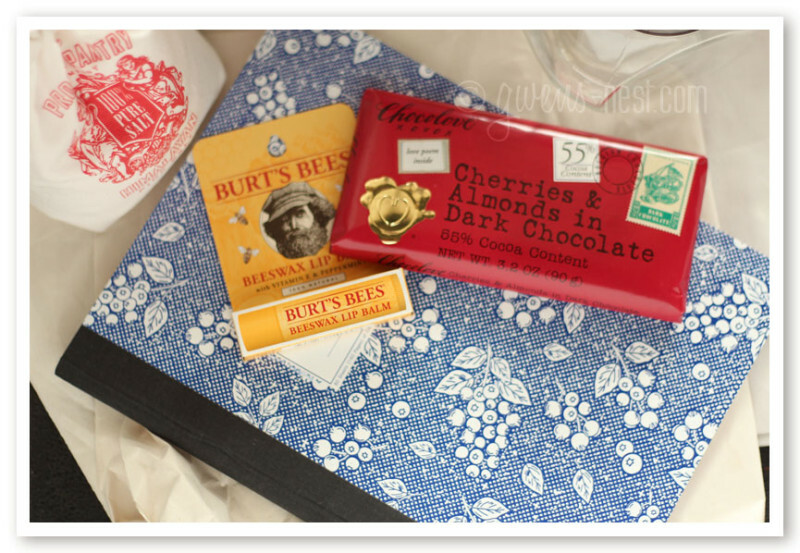 I subscribe to your email list, and my favorite thing from your giveaway will be the chocolate bar! Thanks! Chocolate! And I have tried it once and just loved it! But all the rest of this surprise pkg I would enjoy equally! My favorite things… My cell phone case that acts like a Wallet, vitamix, THM book, and learning!!! Beautiful gifts! They will surely lift someone’s spirits! The chocolate bar looks great! Gwen, your site looks fantastic! I always enjoy your recipes and ideas. Great items! Thanks for the opportunity! I appreciate your recipes. the burt’s bees lip balm. I love burt’s bees! The tower of teas looks fun! I love trying different teas when I get the chance. Thanks, Gwen. Love Love your website and all the THM recipes! Thank You so much! What a lovely idea, sharing favorite things! Thanks! My favorite thing would be the Himilayan pink salt. I enjoy all your posts! I subscribe to you, too!!! Oh how this would be a ray of sunshine to win. We are expecting a March snowstorm tomorrow here in Northern Minnesota. Winter just keeps going and going! I would love to sample the greek seasoning…sounds amazing! Love Gwen’s Nest. You are so helpful! So many great tips as I begin my THM journey. Thank you! What a great collection of gifts! Of course, my favorite has to be the chocolate bar! I so enjoy your humor as you share the realities of your everyday life. Thank you for all you do to encourage others and for being real. This would be AWESOME to win. Could really use a pick me up. Just had a pipe burst at our church where hubby is a Pastor. Entire church flooded. Insurance will cover carpet, not sure about pews. I’m exhausted & give out. Thankful no one was hurt. This too shall pass. My favorite thing is the pen, not shown. I know it would be amazing. Those speak to my heart! Please include me in your giveaway. Thank you! 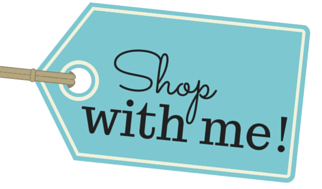 almost obsessive shopper, so i am curious to see if i find more things to spend money on. What a great package! Thanks. #4 Best chocolate bar in the history of ever => AGREE!!! The chocolate sounds so good right now! Thanks for the giveaway! I subscribed to weekly updates! Thanks for all you do. Love your site! Love your blog Gwen!! I would love all these goodies! my favorite right now is Oolong tea!! the Shrinker! Thanks for all your amazing recipes and tips for good healthy living. I subscribed to the weekly emails. Chocolate of course! But I can’t wait to try the salt. This way it doesn’t get lost. Getting ready to start THM again. The jar of seasoning mix. I really want to try the ranch. As a former teacher we are notorious for taking pens. Or having them taken by other teachers or students. I fixed that by attaching a silk flower to mine. Then they didn’t disappear!! I’mg oing to search out that chocolate bar! thNk you so much for your updates and recipes. I really enjoy them. Loving all your great ideas, recipes, and tips to help on this new journey of mine to becoming healthy. My favorite thing is the pen and tablet. I LOVE pens! 🙂 The chocolate bar looks yummy, and I’d love to try your homemade Ranch mix. Thank you! My favorite thing in the box will be the lip balm! Although I’d enjoy trying the other things! I love the chocolate almond and cherries bar! If I did this right, it says I name a favorite thing in the favorite thing give away. I like the mug, and the chocolate, and…. It would be a comfort after being so sick. I subscribed to your emails! Thank you for doing this! The notebook with the blueberries on it! I’m a sucker for cute notebooks! Great collection! A sweet gift for someone! My favorite thing in the box? Chocolate!! And definitely the pen:) Ummmm…..And everything else. Thank you the chance to win it!! Gwen, I love your recipes, Herbal Chit Chat and blog. So glad you’re better! Love that chocolate too! My favorite! Awesome giveaway. I am just getting over being glutened and all that is related to that. Would love to get this. Hi, I found you by researching THM, and now enjoy reading tips from you all the time! I meet with a great group of gals for support and encouragement, and would love to share some of your favorite things with them as well!! What a sweet giveaway! I think my favorite is he tea, no the pen, no wait, definitely the chocolate! Love it all! Love tea and the pen!!!! Thanks! I’d love to try the salt but I know I love Burt’s Bees chapstick, too! I love to try new pens so that’s my favorite. I enjoy your blog. Thanks for hosting such a fun giveaway. I certainly need a pick-me-up, Thanks! Well… it’s really hard to choose my favorite, because you’re including so many nice things. I’ve never tried that kind of chocolate bar, so that looks really good. I wouldn’t mind trying the teas, and I like a pen that flows smoothly. Thanks for a wonderful, fun giveaway. I’m subscribed to your rss feeds (I just don’t read them regular enough). All of it is lovely. Your blog has been a blessing. Thank you for all that you do! Excited to subscribe. Love this! I love the pink Himalayan salt in a bag. All of it looks fun! I would love it if that tower of tea toppled over my way! And the chocolate sounds awesome. In fact I think I like it all!! Love your site!!! Awesome ideas and such an inspiration!! I would love to win any of the items in your giveaway. I think it is a wonderful thing you do to help people and I just need a little pick me up and more inspiration to be successful! Thank you. What a fun and thoughtful give-away! I like the looks of that chocolate bar and have noticed it at my grocery store. Is it THM approved? If so, I am so picking up a bar or two next time I shop! Tea! I love trying new teas. How to choose my favorite item…? Looks like it was made for me, has a little of all my favorite things too. Love your website and all of your thm recipes! I love the jar you’ll fill with our choice of mix–I’d love the ranch! I love the himilain salt! I’ve had it once before and its so great! Wow, what a great set of favorite things! 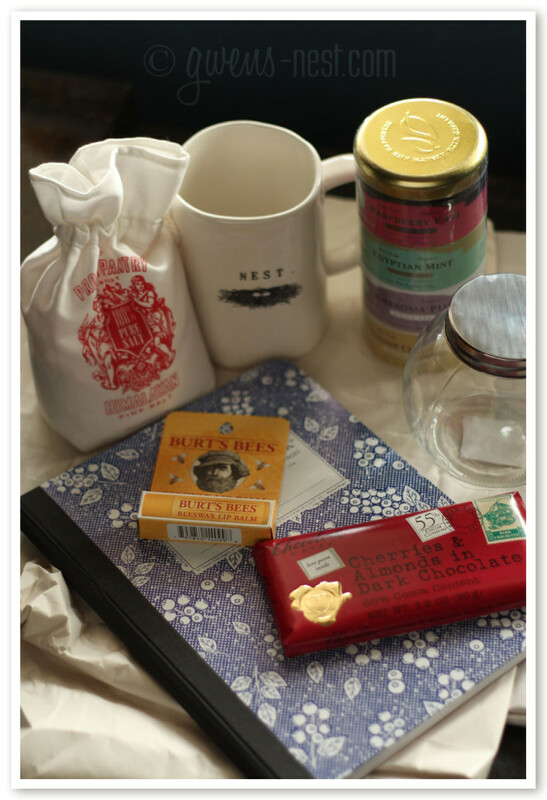 The mug is adorable, I’d love to try the chocolate, and I still haven’t gotten around to making your spice blends, so I’d love to try one!